The Rangers have played 21 games, so they've hit the quarter [REDACTED]. You'll see lots of other team and player analyses from more reputable sites and writers, and I suggest you read those. I wanted to come at this from a slightly different angle. One of the fancystat debates that will never go away is how a player's results are impacted the other team's players. This is commonly referred to as Quality of Competition, and its been debated from pretty much the start of the BehindTheNet era. As more nuanced work on the issue has been done, we find that two things seem true: (1) Quality of Competition Matters... (2) ... but in larger samples its effect tends to be minimized. If there is a key fact to keep in mind, it's that players tend to have *worse* results against *better* players (when better and worse are determined by shot attempt differential). This seems totally logical, but the following chart from the above-linked HockeyGraphs article is a good visual depiction. My goal here isn't to revisit the worth of QoC. I'm not that smart. 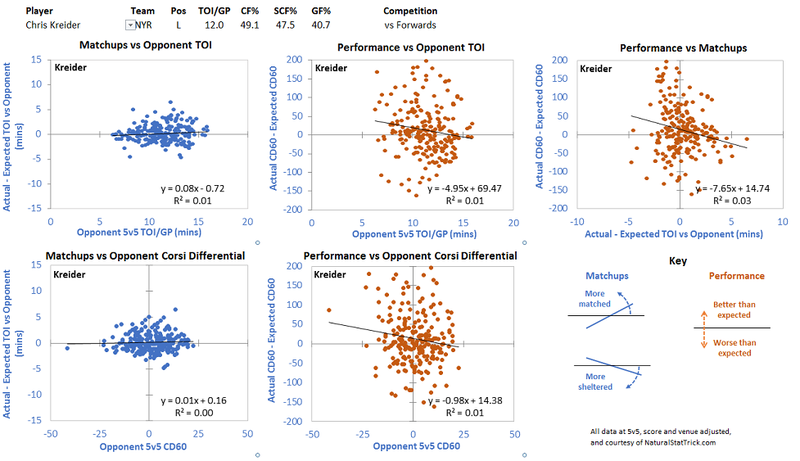 Recently, FotB @petbugs13 (who also wrote that HockeyGraphs article above) posted an interesting visual look at how players are used ("matched") against their competition, and how they perform against that competition. PB was nice enough to share the data with me, and I thought it would be a different way to look at the Rangers' players' first quarter usage and results. First, let's look at the "key" PB provided - you'll want to keep this picture handy so you can review it when looking at the rest of this post. PB annotated this really well, but some high points: The two charts on the left will show a player's matchups against "high TOI" opponents (the top left), and against "high quality" opponents (the bottom left). "Quality" in the latter case is determined by an opponent's Corsi (or shot attempt) differential. The two charts in the middle will show the player's performance against those two categories of opponents. The chart on the far right will show how a player performs against the opponents he is matched up against, and also those opponents he is not matched up against. Expected TOI = (TOI with the opponent + TOI away from opponent) x opponent's TOI%. So if you play 20 5v5 minutes against my team, and I typically play 25% of my team's 5v5 TOI, you should expect to play 5 mins against me. Expected CD60 is just the opponent's average CD60 against everyone they've played. When looking at the results, in general, we want to see a player producing positive results on the y-axis. In those cases, the player is performing better than we would expect against that opponent or that match-up. To simplify, a value above "0" doesn't necessarily mean the player is producing "positive" numerical counts (i.e 1, 2, 3...), but performing better counts than expected (i.e a -1 when the expected is a -3). So let's see the NYR roster's result to this point in 2017. We'll go in jersey number order, for no particular reason, and look at the forwards first. All data is 5v5, score and venue adjusted from NaturalStatTrick. Because there's so much material here, I've prepared summary charts, and provided my main takeaways here, rather than make you scroll through a lot of detail. Most coaches seem equate the other teams "better" players as the ones who get the most TOI. So it is not surprising to see more matching/sheltering based on the oppoonents TOI, as opposed to their Corsi differential. So far, only Hayes, Nash and Zibanejad have shown a "strong" tendency to be matched against the better opposition forwards. [Some players, like Kreider, show a very slight matching, but if it was close to even I erred on the side of treating it as neutral]. All three of those have good positive results too (though Hayes is slightly underperforming against his matchups). Grabner, Desharnais, and Nieves have been the most sheltered. Grabner and Desharnais have terrible results, even with that sheltering. Nieves, on the other hand, has positive performance across the board. Maybe it is time to give Nieves some of Desharnais' ice time. Other underperformers: Fast, Vesey, and Miller-ish. The ZBK line shows up as the main matching line against opposing defensemen. I assume matchups of defensemen against forwards are more driven by the defensive coach. If I'm right, that means this result is because the other team is getting its better defensemen on against the ZBK line, which makes sense. [Note that Nash is the only other "matched" forward]. Almost no forward is matched against the other team defensemen baed on the Corsi differential of those defensemen. So most of the guys are playing against both "better" and "worse" shot differential defensemen relatively equally. The sheltered guys are basically the bottom six guys - Miller, Fast, Vesey, Carey, Grabner. [Again this is not an exact measurement - some guys could straddle the line between categories and I'm just making quick judgments]. Positive performance players: Hayes, Buch, Carey, Nash, Buch. Negative performance players: Miller, Fast, Vesey, Grabner, Desharnais. Ok, now if you want the player-by-player detail, here you go. Matchups: Mostly neutral - he's not particularly sheltered or matched against opposition forwards. Performance vs Comp (Opponent's TOI): Relatively neutral - he hovers around the "0" line regardless of whether he plays against high or low TOI forwards. Performance vs Comp (Opponent's CD): Shows a slight downward trend - he performs slightly positively against "worse" players, and slightly negatively against "better" players. Performance vs Matchups: Relatively neutral - again hovering mainly around zero. A slight negative performance against the opposition forwards he is not matched up against, and a basically neutral performance against the opposition forwards he is not matching. Miller Summary: Considering Miller's generally poor Corsi results, he's not been as bad as we might have expected against opposition forwards. Matchups: Mostly neutral - he's not particularly sheltered or matched against opposition defensmen. Performance vs Comp (Opponent's TOI): Slightly below zero against lower TOI defensemen, and basically at "0" line against higher TOI defensemen. Performance vs Comp (Opponent's CD): Basically neutral whether against "worse" defensemen or "better" defensemen. Performance vs Matchups: Relatively neutral - again hovering mainly around zero but reversed of his results against forwards. A slight negative performance against the opposition forwards he is not matched up against, and a neutral performance against the opposition forwards he is matching. Matchups: Hayes is matching up against higher TOI forwards, but less obviously against "better" Corsi forwards. Performance vs Comp (Opponent's TOI): This was encouraging - Hayes shows positive results versus all but the highest TOI forwards. Performance vs Comp (Opponent's CD): This is more confusing - Hayes has worse than expected results against "worse" quality forwards, but trends to perform better than expected against "higher" quality forwards. Performance vs Matchups: Hayes shows generally positive results against the opposition forwards he is not matched up against, and neutral-to-poor performance against the opposition forwards he is matching. Hayes Summary: Hayes' defensive focus is clear - he's been matched as hard as any NYR forward so far. Considering that usage, his results against opposition forwards has been pretty good. Matchups: Mostly neutral - Hayes is not particularly sheltered or matched against opposition defensmen. Performance vs Comp (Opponent's TOI): Hayes has performed generally positively against all defensemen. Performance vs Comp (Opponent's CD): Basically neutral, hovering around zero whether against "worse" defensemen or "better" defensemen. But with a slight trend toward performing better against "better" defensemen - which is not the league norm. Performance vs Matchups: Hayes has performed better against the defensemen he's not matching, but negatively against the opposition defensemen he is matching. Hayes Summary: Hayes not matching as hard against opposition defensemen, but his results have also been more up and down. Matchups: Fast shows no real matching pattern against opposition forwards. Performance vs Comp (Opponent's TOI): Fast has slightly negative against both low and high TOI forwards. Performance vs Comp (Opponent's CD): Fast has clearly negative results against all opponent forwards. Performance vs Matchups: Fast has clearly negative results against opposition forwards, regardless of his matchups. Fast Summary: Generally disappointing results against opposition forwards. Matchups: Mostly neutral - Fast is not particularly sheltered or matched against opposition defensmen. Performance vs Comp (Opponent's TOI): Fast has performed generally negatively against all opposition defensemen. Performance vs Comp (Opponent's CD): Fast has performed negatively against "worse" or "better" defensemen, with an unsurprising downward trend as the quality of the opposition defensemen improves. Performance vs Matchups: Fast has performed negatively, but less so against his matchups. Fast Summary: Generally poor against opposition defensemen too. Matchups: Kreider's matchup pattern against opposition forwards couldn't be flatter (so no sign of sheltering or matching). Performance vs Comp (Opponent's CD): ...and in positive results against "better" and "worse" quality forwards (with basically break-even results against the "best" and most used forwards). Performance vs Matchups: Kreider's slightly negative against his matchups - meaning the more he's matched, the worse he's performed. Kreider Summary: Kreider generally wins the shot battle against most opposition forwards. Matchups: Kreider's had mostly neutral matchups against opposition defensemen. Performance vs Comp (Opponent's TOI): Interesting to see Kreider's generally negative performance against all opposition defensemen, considering his success against the opposition forwards. Performance vs Comp (Opponent's CD): Kreider's just slightly negative against "worse" or "better" defensemen,. Performance vs Matchups: Again, Kreider's just slightly negative against both his matched and unmatched defensemen. Kreider Summary: Kreider's results against opposition defensemen is not as impressive, but still basically neutral. Matchups: Nieves has been slightly sheltered, mostly getting ice against lower TOI forwards (what you would expect for a 4th line young C). Performance vs Comp (Opponent's CD): ...and against "better" and "worse" quality forwards. Performance vs Matchups: Nieves has been neutral against his non-matches, and slightly positive against his matchups. Nieves Summary: He's doing the job well against his peers, and holding his own against the tougher players. Matchups: Nieves has mostly neutral matchups against opposition defensemen. Performance vs Comp (Opponent's TOI): Nieves has had slightly positive results against the higher TOI opposition defensemen. Performance vs Comp (Opponent's CD): Nieves has positive results against "worse" opposition defensemen, and slightly negative results against the "better" opposition defensemen. Nieves Summary: Overall positive results against opposition defensemen, which is all you want from a young 4th line C.
Matchups: Vesey has been slightly matched against "better" opposition forwards. Performance vs Matchups: Vesey has been neutral agains tthe opposition forwards he avoids, and against his matchups. Vesey Summary: Vesey has basically played opposition forwards to a neutral standoff, at best. Matchups: Vesey has been slightly sheltered against high TOI defensemen, but otherwise mostly neutral. Performance vs Comp (Opponent's TOI): Vesey has had slightly negative results against the higher TOI opposition defensemen. Performance vs Comp (Opponent's CD): Vesey has had worse results against the "worse" opposition defensemen. Performance vs Matchups: Vesey has basically been slightly negative against the defensemen he avoids, and generally break-even against the defensemen he's matches up against. Vesey Summary: On average Vesey's results have been slightly negative against opposition defensemen. Matchups: Carey has been slightly sheltered against high TOI opposition forwards. Performance vs Comp (Opponent's CD): Carey has strongly positive results against lower quality forwards, but performed worse as the quality of opponent forwards increased. Performance vs Matchups: Carey has been generally positive against non-matchups and about even against his matchups. Carey Summary: Like Nieves, Carey has performed well for a 4th line C - winning the matchups you'd expect. Matchups: Carey has been slightly sheltered against high TOI defensemen, but otherwise mostly neutral. Performance vs Comp (Opponent's TOI): Carey has generally outperfrmed his expectations agasint all but the high TOI defensemen. Performance vs Comp (Opponent's CD): Carey has underperformed against the "worse" qualiy defenesemen, and has been slightly positive against the "better" qualiy defensemen. Carey Summary: Carey's results against opposition defensemen have been somewhat less impressive than his results against the opposition forwards. Matchups: Zuccarello has been matched pretty strongly against high TOI opposition forwards. Performance vs Comp (Opponent's TOI): Zuccarello has generally positive results against low TOI forwards, but hasn't had much success against high TOI forwards. Performance vs Comp (Opponent's CD): Zuccarello has been generally neutral performance against players of "worse" and "better" quality. Performance vs Matchups: Zuccarello has generally positive results against the forwards he avoids, and slightly negative results against his matchups. Zuccarello Summary: Zuccarello's performed pretty much like the average NHLer against opposition forwards. Better against the worse, and worse against the better. Matchups: Zuccarello hasn't been strongly matched against opposition defensemen. Performance vs Comp (Opponent's TOI): Zuccarello has slightly positive results against low TOI defensemen, but hasn't had much success against high TOI defensmen. Performance vs Comp (Opponent's CD): Like Hayes, and against the norm, Zuccarello has been performed worse against "worse" defensemen, and better against "better" quality defensemen. Performance vs Matchups: Zuccarello has generally positive results against defensemen he avoids and slightly negative performance against his defensive matchups. Zuccarello Carey Summary: Zuccarello's positive (and unusual) trend slope against quality defensemen is a onoteworthy result. Matchups: Grabner has not been matched heavily against high TOI opposition forwards. Performance vs Comp (Opponent's TOI): Grabner has had negative results against all opposition TOI forwards. Performance vs Comp (Opponent's CD): Grabner has had negative results against forwards of both "worse" and "better" quality. Performance vs Matchups: Again, negative results regardless of whether he's against players hes avoiding or his matchups. Grabner Summary: Disappointing results across the board. At least he's good at scoring empty net goals. Matchups: Grabner has not been matched heavily against opposition defensemen. Performance vs Comp (Opponent's TOI): Again, Grabner has had negative results against all opposition TOI defensemen. Performance vs Comp (Opponent's CD): Finally something positive (against "worse" quality defensemen), but strongly negative results against "better" quality defensemen. Performance vs Matchups: Mostly negative results with one matchup result maybe messing with the trendline. Grabner Summary: Again generally disappointing results against opposition defensemen. Matchups: Desharnais has been slightly shetered from high TOI forwards, less so from "better" quality forwards. Performance vs Comp (Opponent's CD): ...and against forwards of both "worse" and "better" quality. Performance vs Matchups: Again, negative results regardless of matchups. Desharnais Summary: Desharnais has underperformed against opposition forwards. Matchups: Desharnais has been slightly shetered from high TOI defensemen, less so from "better" quality defensemen. 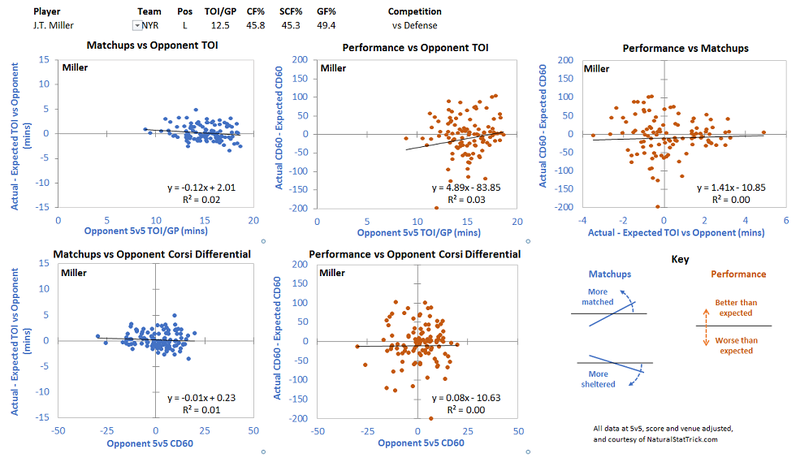 Performance vs Comp (Opponent's TOI): Again, more negative results against all opposition TOI defensemen. Performance vs Comp (Opponent's CD): While still negative, at least Desharnais has amost broken even against "better" quality defensemen. Performance vs Matchups: Again, negative results regardless of whether Desharnais is against non-matchups or matchups. Desharnais Summary: Desharnais has performed worse than expected against opposition defensemen. Maybe time to try someone else in the bottom 6-C slot. Matchups: Nash has been matched against high TOI forwards, less so against "better" quality forwards. Performance vs Comp (Opponent's TOI): Nash has held his own against opposition forwards, basically breaking even. Performance vs Comp (Opponent's CD): Similar neutral results against both "worse" and "better" quality forwards. Performance vs Matchups: Nash has generally outperformed his expected results against his non-matchup opposition forwards, and only slightly negatively performed against his matchups. Nash Summary: Considering how he's been used to match high TOI forwards, I think these are pretty good results overall. Matchups: Nash has not been matched as strongly against high TOI defensemen as he was against high TOI forwards. Performance vs Comp (Opponent's TOI): Nash has held his own against opposition defensemen, with strong positive results against lower TOI defensemen. Performance vs Comp (Opponent's CD): Like his recent linemates Hayes and Zuccarello, Nash has generally positive results against "better" quality defensemen, and worse results against "worse" quality defensemen. Not sure I have a reason for that. Performance vs Matchups: Nash has generally outperformed his expected results against the opposition defensemen he's avoiding, but has also generally negatively performed against his matchups. Nash Summary: While not as strong as his results against opposition forwards, there has still been a lot of positive results from Nash. Matchups: Those are some flat lines, dead center. Buchnevich has not been matched much. Performance vs Comp (Opponent's TOI): Very positive results against all opposition forwards, even with the downward trend against the high TOI forwards. 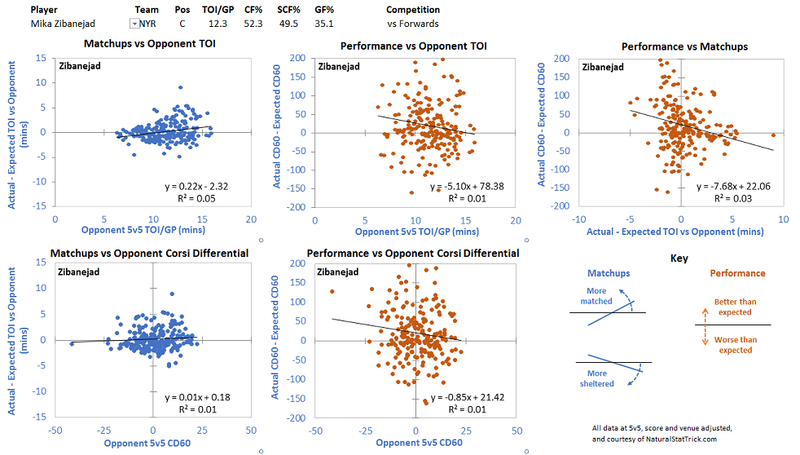 Performance vs Comp (Opponent's CD): Similar strong results for Buchnevich against opposition forwards of "better" and "worse" quality. Performance vs Matchups: Buchnevich has generally outperformed his expected results against his non-matchup opposition forwards, and slightly out-performed against his matchups. Buchnevich Summary: Buchnevich hasn't matched up much, but he's outperformed against all opponent forwards. Matchups: Buchnevich has been slightly matched against high TOI defensemen. Performance vs Comp (Opponent's TOI): Buchnevich has had neutral to slighly positive results against all opposition TOI defensemen. Performance vs Comp (Opponent's CD): Strong positive results for Buchnevich against opposition defensemen of "worse" quality, with slightly negative results against the "better" quality opposition defensemen. Performance vs Matchups: Buchnevich has basically performed his expected results against the opposition forwards he avoids, and generally out-performed against his matchups. Buchnevich Summary: While Buchnevich's results against opposition defensemen have not been as strong as against opposition forwards, he's still performed pretty well. Matchups: Zibanejad has matched somewhat against high TOI forwards. Performance vs Comp (Opponent's CD): Similar strong results for Zibanejad against opposition forwards of "better" and "worse" quality. Performance vs Matchups: Zibanejad has generally outperformed his expected results against the opposition forwards he's avoided, though his trendline slope is more pronounced than anyone else (so he's had more variation between his "good" results and his "bad" results). Zibanejad Summary: Zibanejad has been used to match higher TOI forwards, and has some of the best results of the NYR forwards. Matchups: Zibanejad has matched more strongly against high TOI defensemen. Performance vs Comp (Opponent's TOI): Zibanejad's results against opposition TOI defensemen have generally been as expected. Performance vs Comp (Opponent's CD): Similarly, Zibanejad's results against "better" and "worse" quality opposition defensemen have generally been as expected. Performance vs Matchups: Zibanejad has generally underperformed his expected results against his avoided opposition defensemen, and generally outperformed his expected results against his opposition defensemen matchups. Zibanejad Summary: While not as pronounced as his results against forwards, Zibanejad still has generally at least broken even against opposition defensemen. I would not read too much into these results. This is just a different way to look at how NYR skaters are used against their opponents, and how they've faired so far. The summary charts toward the top show the big picture - the KZB line good, Hayes, Nash, Zuccarello and Nieves decent, and the rest not so good. Tomorrow, I'll put up these same looks for the NYR defensemen. [Teaser: one of the guys is a "Kampfer Fire"]. Again I'm right in my analysis.